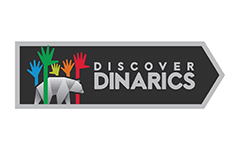 This tour is set up in the framework of project LIFE lynx, which aims to prevent the extinction of lynx in Slovenia through population reinforcement and long-term conservation activities. Our art tour is meant for artists of all levels of experience, as long as you love to work outdoors, in nature! Every day, we go to a different place and we explore a different painting theme. In this way, our art-tour is at the same time a painting course, where you can practise and improve your technique. For this, we invited Slovenian professional painter Karmen Bajec to be our mentor during the tour. 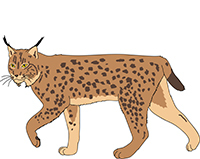 In the 1970’s, three pairs of lynx have been brought to Slovenia in an ambitious reintroduction of this endangered cat. The reintroduction was a big success and the population increased to several tens, while the lynx spread to neighbouring Croatia. For several decades, the population was stable. Recently, however, a decline was noticed. One of the causes is inbreeding. 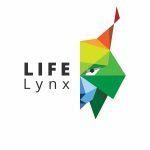 Because of this, several unrelated lynx will be brought to Slovenia in 2019 as part of project LIFE Lynx. For lynx to survive in Slovenia, it is not enough that some animals are released. 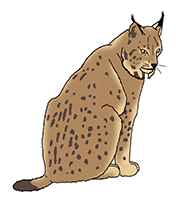 In the long term, the survival of the lynx depends on a positive attitude of the local inhabitants towards this beautiful cat. Our artwork, which is made during this tour, will contribute to this in a unique way: when we present our work, we at the same time present the plight of the lynx to the local people as well as to the media! The Half-open landscape of Lake Cerknica is never the same, as the water level, the light and the colour of the vegetation are constantly changing. However, the Lake is spectacular in any season. Today, we sketch and paint the Lake landscape, with special emphasis on linear perspectives in the landscape. For this, we choose one of the best vantage points at the side of the lake. Of course, we visit various places around the lake as well to get an impression of this speciacular landscape. The price of our custom tours is 1,095 € per person. This price includes 7 nights accommodation, meals, transport in Slovenia, guiding, transfer between Ljubljana airport and the accommodation. Your principal guides will be Paul and Karmen. Paul is a licensed local guide and naturalist, living in southern Slovenia. He speaks English, Slovenian and Dutch. Karmen is a professional Slovenian painter who speaks English and Slovenian. This is an easy tour. Every day, we drive to various locations with a minibus, where we unpack our art material to paint on-site. We also have short excursions, mostly these take no longer than one or two hours. During the excursions, we walk over unpaved forest roads and smaller paths in the forest. While painting we may be standing for a longer time. Please indicate if it is easier for you to have a foldable chair: we can arrange this! We are outdoor regardless of temperatures and wind, so please make sure that you can dress appropriately. However, in case we get constant rain, we move to an indoor location at our accommodation. Art supplies like paintbrushes, if you like. Please note that we will also arrange Art Supplies including paint and canvasses for you!